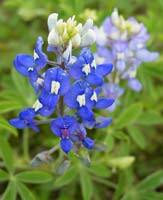 The Brazos Bluebonnet Quilt Guild is a tax exempt, non-profit, educational organization. It was first organized in late 1985 by a small group of women interested in quilts and quilting. The number of members has gradually increased to our current membership of over 100 active and honorary members. The mission of the guild is to educate members and the public about quilts and quilting, and to support deserving charities. Funds raised by the Guild are used to bring in nationally and locally recognized speakers to our monthly meetings and workshops. The programs are educational and interesting, providing quilting information on history, techniques, materials, and other aspects of this popular art form. Workshops are offered to further our knowledge. The Guild also sponsors a bus trip to a local Quilt Show. The best education, however, often happens in small groups or “bees” where members meet for sewing and socializing. We sponsor local Brazos county high school seniors with college scholarships (two $1,000 scholarships were presented in 2017) We also support the "Go-Texas" scholarship program (part of the Houston Livestock Show & Rodeo). Our guild provides a Brazos county "Go-Texan" quilt annually, and beginning in 2018 will begin providing a Robertson county "Go-Texan" quilt as well. The Guild stages a biennial quilt show in the fall of odd numbered years. A recent show displayed over 100 quilts, including judged entries and special exhibits. Attendees may shop at our Bluebonnet Store which offers goods made and donated by our members, as wells as supporting the numerous other vendors who participate in our show. Booneville Days. We strive to educate the community and help where we are needed. Quilts are a wonderful part of our heritage and bring comfort to our lives. Each year the Care Quilt Committee coordinates the donation of time & resources to create care quilts. These quilts are distributed within our community, providing comfort to both children and adults. Organizations we assist include but are not limited to: Phoebe's Home, The Prenatal Clinic, St. Joseph's Cancer Center, Hospice Brazos Valle, Child Protective Service &, American Red Cross local disaster relief. Over 270 Care Quilts were distributed in 2017! We also provide a quilt to KAMU for their fundraising auction and a "Welcome" banner to every new Habitat for Humanity homeowner in our area. The guild meets monthy on the second Tuesday of every month at 7:00 p.m. Sign-in & social time begins at 6:30 p.m. The meeting is in Room 102 of the Brazos Center, 3232 Briarcrest Dr., Bryan, TX 77802. Our membership is made up of people who love quilts and have an interest in their history as well as promoting this popular and beautiful craft. Being able to quilt is not a requirement for membership. 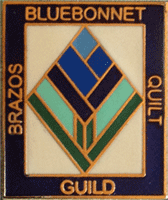 New members are always welcome to join the Brazos Bluebonnet Quilt Guild. Membership dues: $35.00 per year. Many guild members treasure their friendships and abilities to exchange ideas with other members most of all. To join our guild, download the 2019 membership form, fill it out & turn it in with your membership dues at the next monthly meeting! Be sure to introduce yourself as a guest or first time attendee!